Moscow’s Red Square is the center of the football universe as the world’s broadcasters cover the World Cup. The BBC’s Match of the Day is broadcasting to UK living rooms, as well as digital platforms and social media channels with coverage that includes hundreds of hours of match footage, studio discussion, interviews, news packages, and analysis. 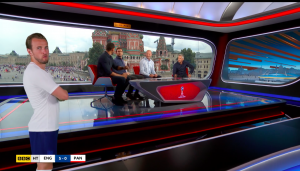 England’s Harry Kane is an example of Vizrt’s AR in BBC’s broadcast of the World Cup. Match of the Day Live’s Red Square studio features augmented reality (AR) graphics to help pundits and hosts tell the story of each match with stats, team news, and a few surprises along the way. This is all set up with an impressive view of St. Basil’s Cathedral in the background. The aim is to let the viewer feel that they are being taken directly from Red Square into the live stadium action with a 180-degree camera move. Croatian tracking specialists, stYpe are providing tracking for six cameras in the studio while the UK’s Alston Elliott (AE) were challenged to design and operate AR graphics to complement the broadcaster’s teams. Vizrt’s Viz Engine is the workhorse behind all of the graphics rendering, including AR in the studio and virtual set extensions to hide the massive amounts of production systems in the Red Square studio. “BBC Sport, AE, stYpe, and Vizrt have worked on many major events together, and in my view make a veritable AR dream team. We’re incredibly proud that four RedSpy systems are tracking every camera movement from the Red Square studio and truly excited to be covering the World Cup together, making it another successful collaboration,” says Stype Cajic, stYpe CEO. “We’re very proud that BBC Sport and Alston Elliott continue to innovate with our technology, this year’s World Cup is the boldest yet for all involved, let’s hope England’s football team do us proud too” says Mark Pizzey, Vizrt’s Key Account Manager.